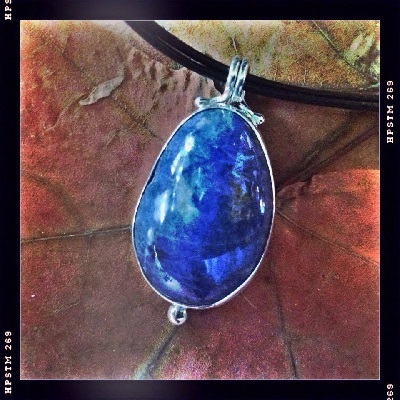 From The Workbench – Purple blue stone brought in rough. Cut and polished and made into a silver pendant. The nature of the stone remains a mystery. Its secret is part of its power and beauty. We associate blue with the ocean, and thus with vastness and cleanliness. The waves cleanse the shore. It is said that people who love blue are caring and loyal. However, they are known for their logic rather than for their sentimentality. This is what keeps them loyal. They do not allow sentiment to get in the way of duty. Like the waves of the ocean, they always return to the same shores. Blue can evoke the sky, also. Again, in this capacity, it represents far-reaching compassion. The Gift Of Jewelry – Here is a great tip for a first-time gift to that special someone: Paying attention to what your friend wears on a daily basis can provide the most important clues, but do not observe with your eyes only. Ask questions. It makes for great conversation and you may discover that the pendant that accompanies every single outfit is a family heirloom. Offering a new pendant, in this case, might not have the intended effect. Instead, consider a different type of jewelry to wear in addition to the cherished piece. Something that pairs well with it. 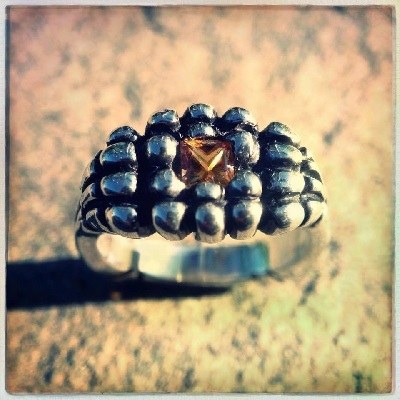 From The Archives – Yellow sapphire and sterling silver corn ring. A simple play of light suffices to reveal a heart where there appeared to be a regular gem. There’s a metaphor about love in here somewhere. Jewelry Trends – Romantic or a bit creepy? George Engleheart (1750–1829), one of the most acclaimed English painters of portrait miniatures produced an astounding series of “Lover’s Eye” miniatures for lockets, pendants, brooches, bracelets and even rings. These did not merely depict the eye of a secret or hopeful lover, they also represented the eye of a child, spouse, parent or sibling. 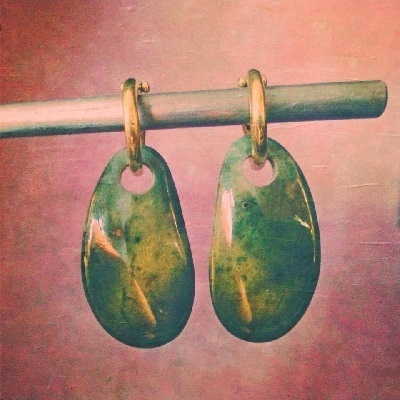 Fresh off the workbench – Local serpentine and gold earrings. A good walk rests the back after sitting at the bench for long hours, but it is so cold these days, and so many ideas beg for attention, that it is difficult to resist standing at the cutting wheel off and on, in lieu of a walk. It is just as relaxing.